Jack McCaffrey and Colm Cavanagh. TYRONE WILL MEET Dublin in the All-Ireland football final after both sides enjoyed vastly different semi-final wins over the weekend. On Saturday, Dublin had nine points to spare against Connacht champions Galway in Croke Park. Jack McCaffrey, Ciaran Kilkenny, Brian Fenton, Con O’Callaghan and Paul Mannion were among Dublin’s star men while Ian Burke stood out for the Tribesmen. Kilkenny kicked three points from play and ran the Dublin attack. Afterwards, he was given the nod by Sky Sports. McCaffrey meanwhile was picked out for the honours by the Sunday Game on RTÉ. The Clontarf defender returned from a torn cruciate earlier this summer but is back to his best and used his pace to make a number of thrilling runs forward. Earlier today, it was Tyrone’s turn to book their place in the showpiece game, with a narrow 1-13 to 0-15 win over Monaghan. Mickey Harte’s side had strong performers all over the field but Moy native Colm Cavanagh claimed the big prize on both Sky Sports and the Sunday Game. Who do you think deserved the awards? Let us know in the comments section below. Email “Do you agree with the man-of-the-match winners from the weekend's All-Ireland SFC semi-finals?”. 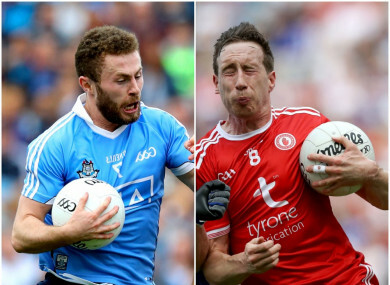 Feedback on “Do you agree with the man-of-the-match winners from the weekend's All-Ireland SFC semi-finals?”.